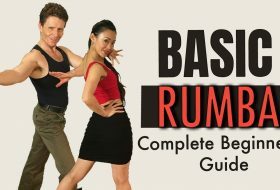 American style (also called “Rhythm”) Rumba is kinda like American football – both are super popular in America and America alone. 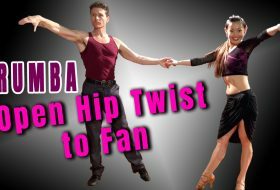 The International style Rumba, on the other hand, is more like Soccer, super popular all over the rest of the world, especially in Europe and Asia! 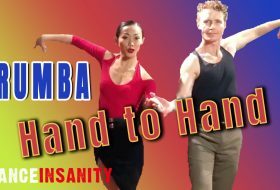 So, if the rest of the world don’t want to dance American style Rumba, why would you? I’ll tell you why! Because American style is easier in count and technique. Though I confess: my “more” favorite is the International style. Now, how can you differentiate and dance both styles differently? For American Style Basic Box Step, you make a box with your footwork. Leader footwork: Forward left, Side right, Close left to right. Back on right, Side left, Close right to left. Follower footwork: Back right, Side left, Close right to left. Forward left, Side right, Close left to right. Leader footwork: Forward left, Replace right, Side left. Back on right, Replace left, Side right. Follower footwork: Back right, Replace left, Side right. Forward left, Replace right, Side left. The Slow step will start on the count of 1. 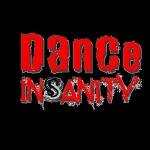 The dance uses Slow Quick Quick Timing – Slow (1,2) Quick (3) Quick (4). Each Slow = 2 counts and each quick = 1 count. To make a full box basic: Slow-Quick-Quick, Slow-Quick-Quick. I will leave you now, with a sampling of how American style is danced versus International style. Leave me a comment and let me know which one appeals to you more and why! This was an interesting read. I’m from UK and have only recently learned about American Rhythm style from videos on line. It has been nice to see the differences between the American style and international which I dance. 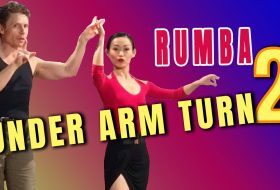 I have a quick question, from a few videos I’ve seen of American rhythm competitions the rumba seems a bit faster than what I’m used to dancing international style to. Is it usually any faster? American Rumba is faster than International style. Generally, Am. Rumba is around 120-140 BPM, while International is about 90-110 BPM. Different competitions/ countries will play the Rumbas at different speeds. Thanks LW, a very clear explanation. 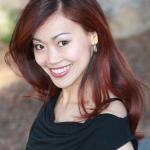 I just wanna social dance in America with my Beautiful Korean-American wife; so it’s a no brained — American style for us. Is there a similar issue with Cha Cha? Great information. I have found that hearing (and doing) the International count is incredibly difficult after having done American for many years. Do you have any tips on this?